SIRTE, Libya - Libyan revolutionary forces claimed to have captured parts of a sprawling convention center that loyalists of Muammar Qaddafi have used as their main base in the ousted leader's hometown and were shelling the city to try to rout snipers from rooftops in their offensive aimed at crushing this key bastion of the old regime. The inability to take Sirte, the most important remaining stronghold of Qaddafi supporters, more than six weeks after the capital fell has stalled efforts by Libya's new leaders to set a timeline for elections and move forward with a transition to democracy. Qaddafi supporters also hold the enclave of Bani Walid, where revolutionary forces have been stymied by a challenging terrain. But the transitional leadership has said it will declare liberation after Sirte's capture because that will mean it holds all of the seaports and harbors in the oil-rich Mediterranean coastal country. British Defense Secretary Liam Fox pledged to keep up NATO airstrikes even after Sirte's fall, saying the international military action would continue as long as the remnants of the regime pose a risk to the people of Libya. Hiding Qaddafi speaks: "Be courageous, rise up"
"We have a message for those who are still fighting for Qaddafi that the game is over, you have been rejected by the people of Libya," he told reporters Saturday in Tripoli before flying to Misrata. Revolutionary forces began a major attack on Sirte on Friday after a three week siege from the outskirts of the coastal city, during which they said they were giving civilians time to flee. On Saturday, fighters fired rockets into the city from the backs of pickup trucks, though visibility was severely limited by a sandstorm. Libya's de facto leader, Mustafa Abdul-Jalil, the head of the governing National Transitional Council, said the battle for Sirte has been "ferocious," with 15 revolutionary fighters killed and 180 wounded on Friday. "Our fighters today are still dealing with the snipers positioned on the high buildings and we sustained heavy casualties," he said at a joint news conference in Tripoli with Fox and Italian Defense Secretary Ignazio La Russa. Abdel-Basit Haroun, a revolutionary field commander, said 32 people had been killed in two days of fighting, while the military council in the nearby city of Misrata, which has sent many fighters to Sirte, reported 80 wounded. The council said revolutionary forces were attacking houses to try to eliminate the "overwhelming hordes of snipers out there." Sirte, 250 miles (400 kilometers) southeast of Tripoli, is key to the physical unity of the nation of some 6 million people, since it lies roughly in the center of the coastal plain where most Libyans live, blocking the easiest routes between east and west. Mohammed al-Rajali, spokesman for the brigades attacking the city from the east, said the fighters have gained control of the Ouagadougou Convention Center, an ornate complex in the city center that Qaddafi frequently used for international summits. But they were meeting heavy resistance from villas behind the building so were focusing on firing artillery from the outskirts. "After the intensive shelling, we will move forward," he said. A military spokesman in Tripoli, Abdul-Rahman Busin, and several commanders and fighters confirmed the center was under control of revolutionary forces. "We have passed the area and we moved on to the residential area behind it," brigade commander Musbah Alhadar said. "Our forces are camping around the center because the center itself has been destroyed by the NATO airstrikes and our artillery." Seizing the convention center complex, named after the capital of the West African nation of Burkino Faso, would be a significant gain for the attackers. Throughout the siege, Qaddafi fighters have used the walled complex as a base and stronghold. 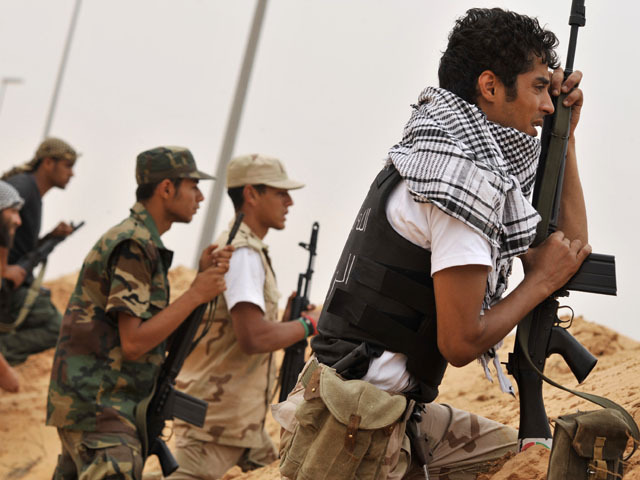 From there they were able to dominate surrounding neighborhoods and assault revolutionaries trying to enter Sirte. Anti-Qaddafi forces also have surrounded the central Green Square and a presidential palace after fierce street fighting in the heart of the city. Loyalist forces have been driven away from Ibn Sina Hospital where hundreds of civilians have sought refuge from the fighting, according to another commander, Suleiman Ali. NATO warplanes flew overhead but no strikes were immediately reported. Abdul-Jalil, meanwhile, called on the international community to help Libyans treat the wounded, saying they could deduct the cost from Libyan assets that were frozen under Qaddafi's regime. The international community has rallied around Libya's efforts to move forward with forming a new government, with transitional leaders promising elections within eight months after liberation is declared. Fox announced 500,000 pounds ($775,000) and extra military expertise to help Libya prevent the proliferation of weapons, including portable missiles capable of shooting down aircraft.